This week I managed to get my sister in laws quilt finished, photographed and posted. It took me way longer than I hoped, but I am glad it is finally on its way to sunnier climes. 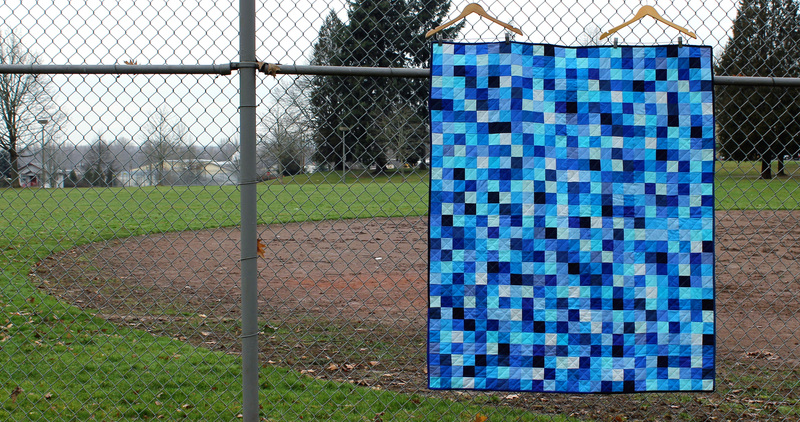 The quilt was too long to be photographed in my usual spot so I took it out to the local park and hung it on the fence around the baseball practice area. It was a little to wet and muddy to get more creative but I liked the location change-up. 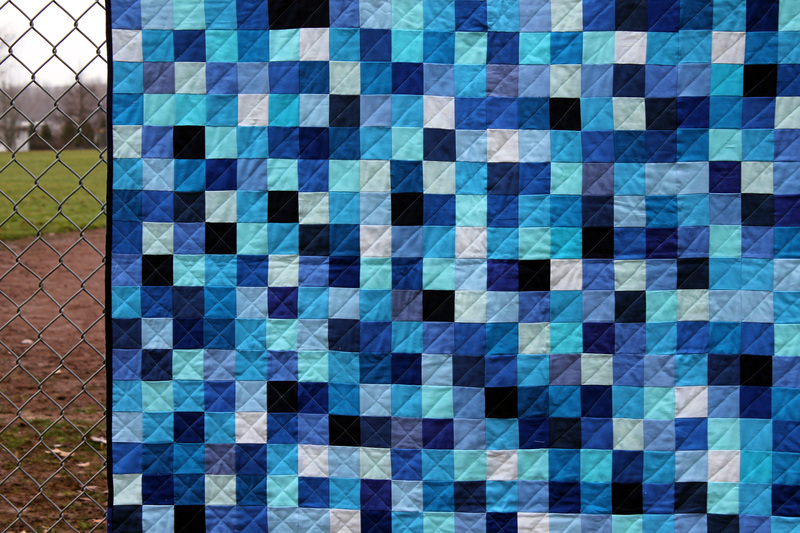 The blocks for the quilt were made using the “Trip Around” technique and tons and tons of blue solids. If you are interested you can read more about the initial design process here. For the quilting I was originally just going to do straight line stitching in on diagonally on the quilt in one direction. 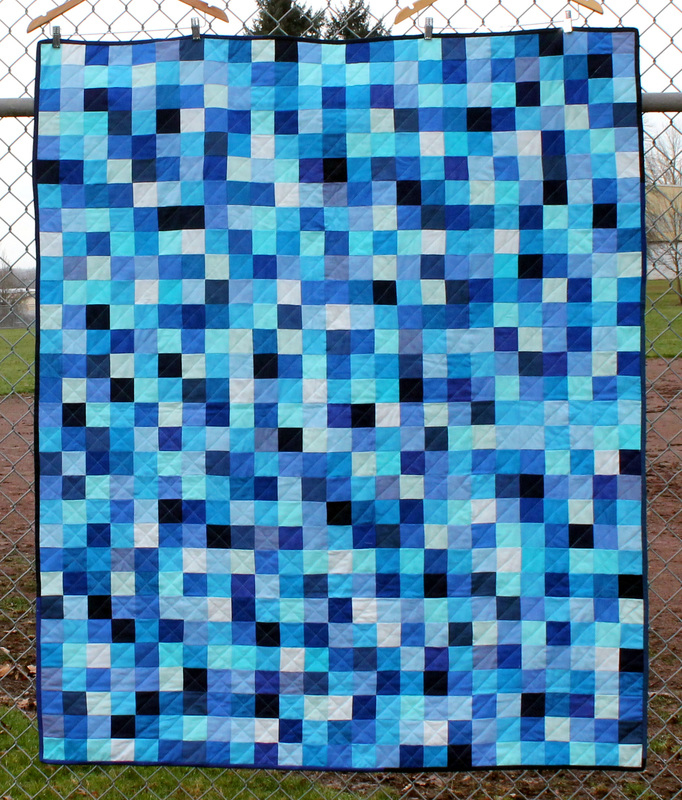 It made the quilt feel like the water was flowing in one direction, which I loved. I then had the brilliant idea to add ten lines of quilting diagonally opposite to the flow to represent the ten years that my sister-in-law has been married…the ten years where her path has intersected with someone else. Okay I was being really sentimental and mushy and I will stop now! That is just a beautiful quilt!!!! Great job! Thanks. I am really pleased with how it all finished up, after months and months of procrastinating about what to do! It’s great! Adding the lines of quilting in the other direction resulted in part of the quilting matching with the fence in the background. Intended or serendipity? This looks so wonderful – at first, I wasn’t a fan since blue alone isn’t high on my list of favorites, but this sure is striking! Must feel great to be finished, ‘eh?! Love it! Especially the backing! I really like that quilt a lot! And what a great backing to match. What a beautiful quilt! And thanks for linking the initial designing. I’d not heard of the trip around the world technique, but I think I’ll have to try it now! Eep! So cute! And I love the ten additional quilting lines. So sweet! The backing was an inspired choice. Beautiful job. 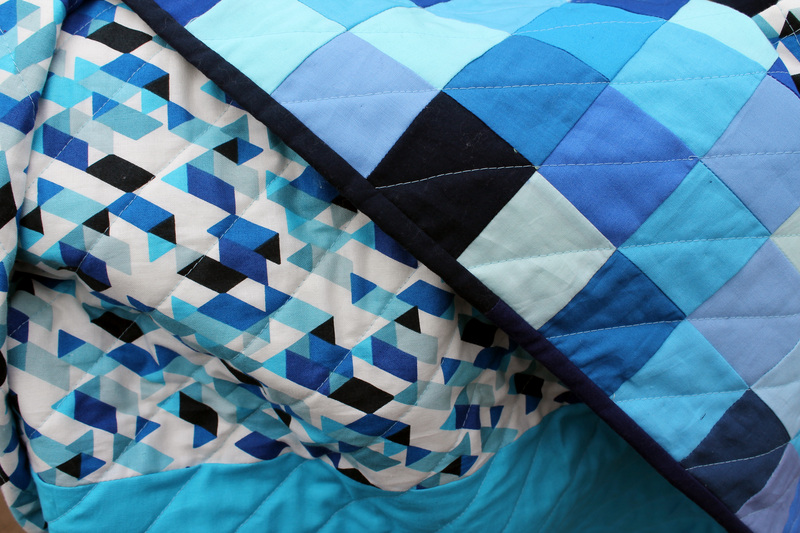 Diagonals are my favourite kind of quilting, not only because they’re easy, but because they give such nice puffy loft without interfering with whatever colour fireworks I’ve been producing on the front. The color is amazing, it’s something I could look at all day. And the constellations fabric is so perfect for backing. Who wouldn’t love it – it is amazing! I love the ten line idea too. Great photo spot! I think the ten lines of quilting is a great addition. And that backing fabric was a perfect find! Looks Great, wish I had a sister in law like you. I love! I must make one. It’s on the list. The really really really long list. lol! love love love this quilt, cath. i especially love the quilting. how long did that take you? she will love this gift! so glad you decided to switch up those trip along the world blocks! Thanks Ashley. The quilting took me about 4 hours. Nice and simple straight lines but it worked. and great, the husband just said, “I LOVE THAT!” glad his is almost finished… he’s not getting another one for a LONG time. or ever. You are much better than me. I have not even started a quilt for my husband. Maybe one day. This is great and the back is perfect. Nicely done! It looks superb. Well done. I’m sure your sister in law will love it. The quilt is gorgeous. Love all the blues. If your sister doesn’t like it, I will be happy to take it! I like the meaning behind the ten lines of extra quilting. Very thoughtful. Oh wow I just love how this turned out! And the backing is so perfect! It should suit sunnier climes well as it has a marine/ocean vibe about it – or maybe blue sky.